Paul Huang (violin) and Helen Huang (piano, not related) performed an excellent concert Sunday afternoon at Walter Hall in the Edward Johnson Building at the University of Toronto. When I read in the pre-concert publicity that Paul Huang has been called the next Joshua Bell, I was surprised, but when he played Prokofiev’s first sonata, with its broad and varied expressive range and its considerable technical demands on the player, I understood why. 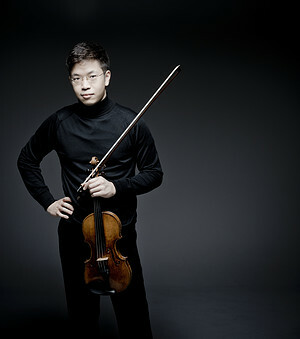 He is a promising young violinist, talented, accomplished, and sensitive. Paul Huang’s enviable technique and expressive talents showcased this large-scale, demanding, melancholy and transcendent work, written between 1938 and 1946, in the years of World War II, to great effect. During the war years, Soviet censorship and criticism of musicians was lessened; before and after the war Prokofiev ran into trouble with the Soviet ‘music police’. Both pianist and violinist made the difficult sections of the sonata seem a matter of course. There were contrasts of dynamics, tempo, range, texture, and articulation. These seemed to pose no technical problems for the musicians; their attention was always on the expression. The same can be said of the pair’s performance of the impressionistic sonata by Saint-Saëns, a beautiful study in colours and harmonies. Written in 1885 at the height of the composer’s renown in France (he was elected to the Académie des Beaux Arts in 1881 and made a member of the Legion of Honour in 1884), this piece calls for a delicacy in the presentation of sonorities that the performers carried out convincingly and impressively. In these works, the violinist and pianist are equal partners. Helen Huang’s playing is to be praised for her phrasing and shading, for the precise and consistent co-ordination with the violin that only a very talented and diligent musician can achieve (the playing was synchronized exactly between the two throughout the afternoon), and especially for the beautiful tone she draws from the piano at all times in all styles and textures. It is not suprising that she favours legato pedaling (applying the pedal after the notes) over rhythmic pedaling (with the notes). Not many pianists would dare to play the last note of the encore, a sophisticated arrangement of Danny Boy (offered perhaps because the hymn based on that melody and the women whose hope it honors), as softly and confidently as she did. Also well undertaken were Dvorák’s Sonatina, an Andalusian, flamenco-style dance by nineteenth-century composer Pablo de Sarasate, and a piece by British Vedantist composer Cyril Scott called Lotus Land, arranged for violin and piano by the famous and notorious Fritz Kreisler. The hall is well designed and well appointed. The pair made the wood ring out in soaring passages. The seating is suitable for wheel chair and an elevator provides access. This audience knows a good thing when they hear it; the standing ovation was well deserved.